Royal Cork Optimist Teams are first and second at VP Trophy. The Royal Cork were invited by IODAI to enter two teams into the Vice Presidents Trophy last March – interested sailors applied and made up our two teams of four. Team Racing training started with John Durcan and then continued with Thomas Chaix on his return from Bcademy in early May. Thomas split the eight sailors into teams and worked on their team racing skills which culminated in our sailors travelling to compete in this year’s Vice President’s Trophy held at Howth Yacht Club today. The Vice President’s Trophy was inaugurated in 1986 and has been running on and off for the past 29 years. The Trophy and Event was created by Helen Mary Wilkes who at the time of it’s inception was the Vice President of the world governing body for Optimists, IODA. She developed the VP Team Racing event which is a club event for Optimist Sailors with at least one sailor of each gender on the team. Teams are made up for 4 sailors from one club and for the 2015 event there were 8 teams entered. A schedule of 28 round robin races was drawn up with each of the teams due to sail against every other team and then the option of a semi finals and finals (weather and time dependent). Against this backdrop the eight teams took to the waters off Howth this morning under Race Officers Neil Murphy and Richard Kissane. There were teams representing Royal Cork, Royal St George Yacht Club, Howth Yacht Club and the Worlds Team travelling to Poland in August. The round Robin races threw up some surprises but our teams sailed well and consistently notched up wins. The Worlds team who are unable to travel to Ledro stepped out of the competition at the semi final stage. 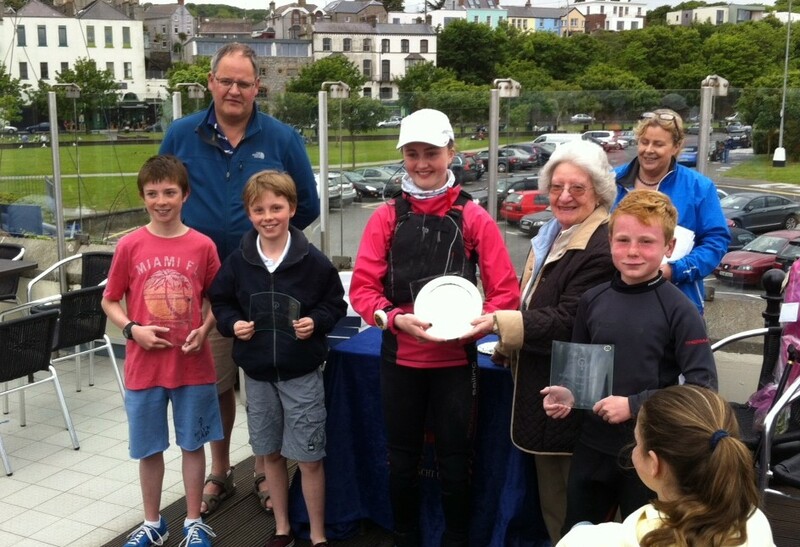 After the round robin concluded and totals were added – Royal Cork Blue captained by Sophie Crosbie and her team mates Cathal O’Regan, Harry Twomey and Rory O’Sullivan raced against Howth Yacht Club in the first semi final. Royal Cork Red captained by Emily Whitaker and her team mates Conor Walsh, Killian O’Regan and Michael Crosbie were racing against Royal St George in the second semi final. Each semi final ran a similar course – one race each and all dependent on the final race (best of three). Word came through that both Royal Cork teams had beaten their opponents and were in the final. I am sure the cheers could be heard up and down the dinghy park as the fleet had just returned from league racing on the Curlane Bank. An amazing achievement to have our two teams in the Final and then the nail biting final series began!. Race One went in RCYC Blue’s favour, Race Two to RCYC Red and then it was all to play for in the last race. Unfortunately, the wind died and the race went over the time limit. Race three was discarded and on count back the final awarded to Royal Cork Blue – Sophie Crosbie, Cathal O’Regan, Harry Twomey and Rory O’Sullivan. Royal Cork Blue now go on to represent Ireland at the Optimist European Team Racing Championships 2015 in Ledro, Italy this August. 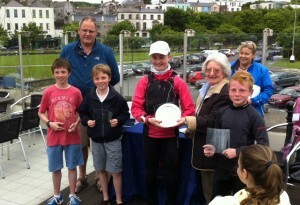 VP Trophy Runners Up – Emily Whitaker, Killian O’Regan, Conor Walsh & Michael Crosbie. 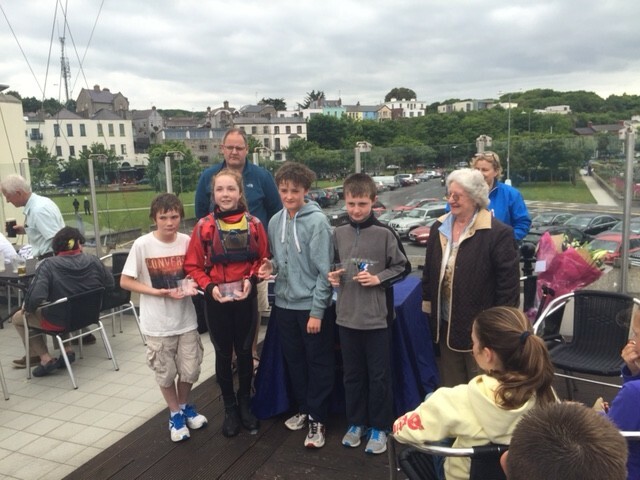 Well done to all our sailors, Team Coach – Thomas Chaix and travelling parents – William Twomey and Andrew Crosbie.